Black and white action photo of the finish of the first heat of the 2.24 Trot at the Western Maine Agricultural Exposition, Wednesday, July 18, 1934, Narragansett Park at the Gorham Fair Grounds, Gorham, Maine. 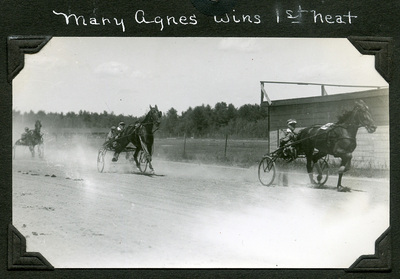 Horses pictured, right to left, are Mary Agnes, driver Jordan up, finishing in first; Ethel McDonald finishing second, Day up; and Jane Express, Proctor up. Jane Express finished in in fourth place. Third place finisher Evening Express, Knight up, is obscured by Ethel McDonald in this photo.